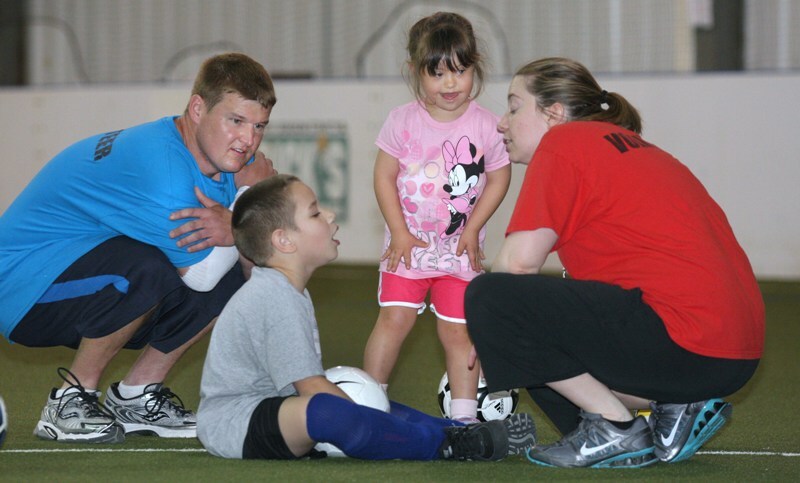 The Outreach Program for Soccer is a community-based program affiliated nationally with US Youth Soccer and locally with Lexington Youth Soccer Association designed to meet the needs of athletes with physical, developmental, and/or intellectual disabilities. 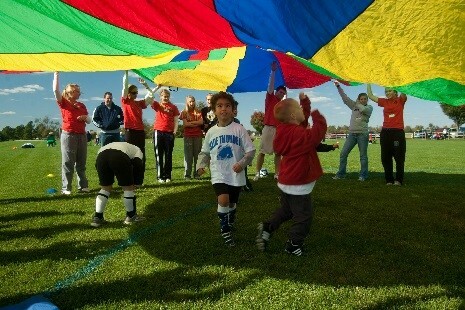 Our goal is to provide a safe, fun and exciting atmosphere where athletes can learn and play this extraordinary game. 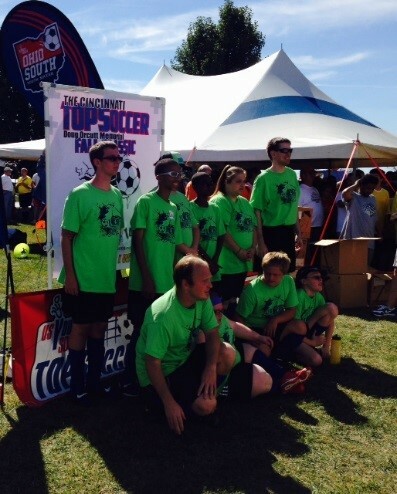 Who is eligible to play in the TOPSoccer league? Individuals with cognitive or developmental disabilities ages 4+. Disabilities might include but are not limited to: ADD/ADHD; Autism Spectrum Disorder; Down syndrome; Learning Disability; Traumatic Brain Injury (TBI); Developmental Delay; Vision or hearing impaired; Muscular Dystrophy; Cerebral Palsy. What does the TOPS program in Lexington look like? Each season approximately 50 athletes, ages 4 and older with a wide range of cognitive or developmental disabilities, participate across three teams. Our overall team name is Blue Thunder. We have no paid staff and rely entirely on volunteers. Our volunteers serve as coaches, buddies, and/or on committees that assist us with fundraising, advertising, planning, or special events. Our league is made possible because of the generous support of many community organizations, businesses and individual donors. We have received major support from The Jerome S. and Grace H. Murray Foundation, the Children’s Charity of the Bluegrass, the Kentucky Youth Soccer Association, and Rod Hatfield Chevrolet/Chevy. How much does it cost to play LYSA TOPSoccer? Registration is $25.00. The fee covers all KYSA and LYSA registration fees and insurance. We will provide each player, each season, a shirt and one pair of socks. Shorts are provided if needed. Scholarships are available. Payment can be made online using the registration link. For paper registration, checks should be made out to LYSA and sent to the address on the form. We cannot accept cash payments. For additional information contact the LYSA Registrar Lois Stephens at 859 361-5719 or the TOPS League Director Jessie Birdwhistell at 859 608-4160. TOPS holds a fall and a spring season. Practice is held on Sunday afternoons from 1 to 3 p.m. for one hour for each team. We do not practice on Labor Day, Memorial Day, the first weekend of Fayette County Spring Break or Easter weekend. If you have registration questions, please contact the LYSA Registrar Lois Stephens at 859 361-5719. For other questions email them to info@lysa.org or call 859-223-5632. During the fall season we use field #3 (nearest the concession stand) at Masterson Station Park. During the spring season we practice at Kentucky Indoor located at 404 Sporting Court in Lexington. What type of volunteers do we need? Volunteer positions include coaches, assistant coaches, Buddies, and committee members that focus on publicity, fundraising, planning, and organization of the league. Anyone can volunteer! Buddies work on the field with athletes who need assistance (either physically or cognitively). This could include pushing a wheelchair, cheering players while they scrimmage, guiding a player on the field, or just helping a player to stay focused and participating in practices and games. Buddies should be in middle school or older, have an open mind and willing to commit their time to the as much of the season as they can. The commitment to attend regularly is very important because a bond develops between the player and the buddy very quickly. When players get used to a certain buddy and then they are no longer there, it is sometimes difficult for the player. A general knowledge of soccer is helpful but not necessary. Where can I get information on how to volunteer? You can sign up to volunteer on our webpage using the Volunteer Sign-Up Form or call Janice Birdwhistell at 859-229-7670 or by email at jeb147@aol.com. An email confirming that we have received your form should be sent to you immediately upon completing the online form. If you do not receive an email confirmation, please let us know. How can I find out if practices are cancelled? Go to Rainedout.com, enter LYSAKY in the search box, and then click on LYSAKY. Follow the directions in the blue “Sign Up!” box. Be sure to check your junk mail folder in case your validation code does not appear in your inbox. We always try to email before 11am on the day of practice if we must cancel.